Now you use PROC COPULA to simulate the data. The VAR statement specifies the list of variables to contain simulated data. 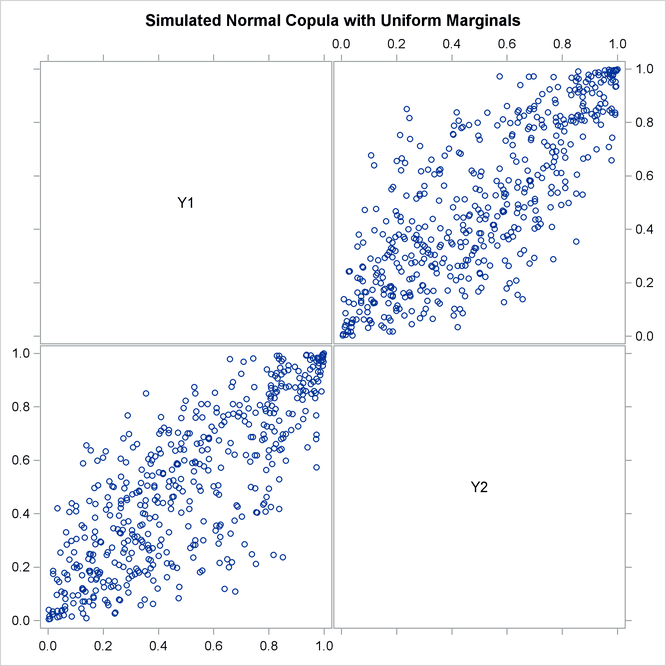 The DEFINE statement assigns the name COP and specifies a normal copula that reads the correlation matrix from the inparm data set. The SIMULATE statement refers to the COP label defined in the VAR statement and specifies some options: the NDRAWS= option specifies a sample size, the SEED= option specifies 1234 as the random number generator seed, the OUTUNIFORM=NORMAL_UNIFDATA option names the output data set for the result of simulation in uniforms, and the PLOTS= option requests the matrix of data scatter plots and marginal distributions (DATATYPE=ORIGINAL) and theoretical cumulative distribution function contour and surface plots (DISTRIBUTION=CDF). Theoretical distribution graphs work only for the bivariate case. The graphical output is shown in Output 10.2.2 and in Output 10.2.3. 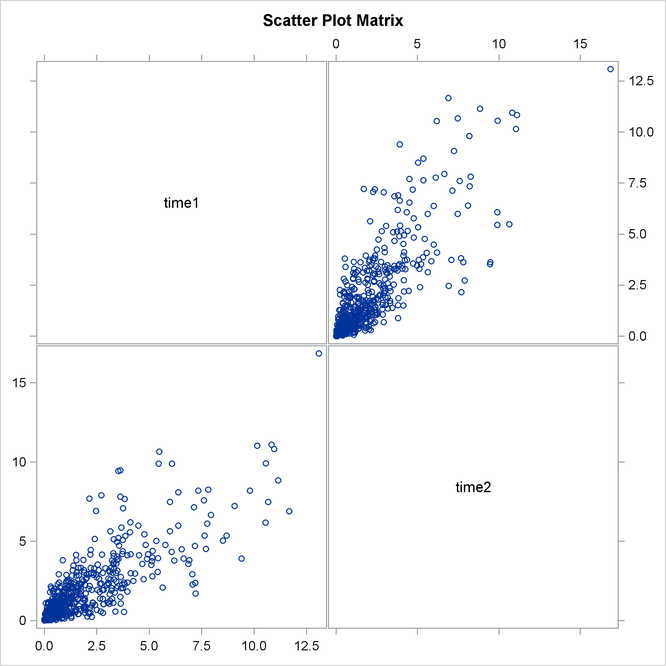 Output 10.2.2 shows bivariate scatter plots of the simulated data. Also note that due to the high correlation parameter (0.8), the scatter plots are most dense around the 45 degree line, which indicates high dependence between the two variables. 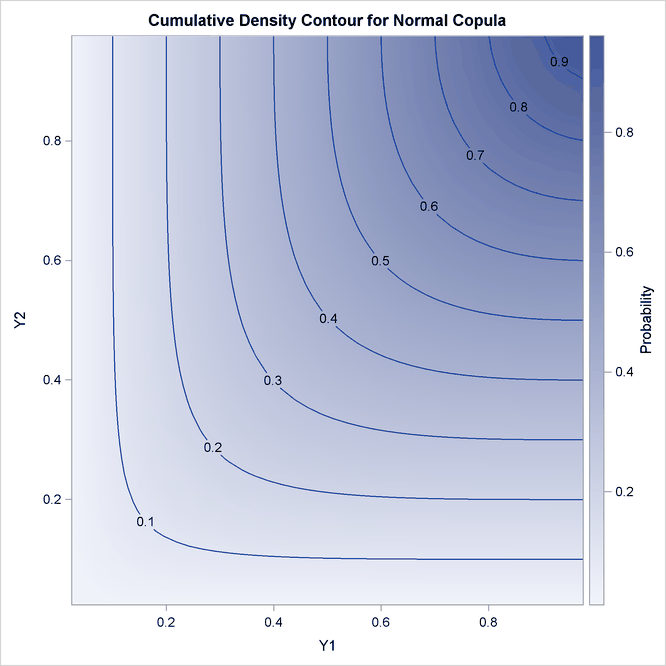 Output 10.2.3 shows the theoretical CDF contour plot. If the correlation parameter were set to 0, then knowing copula properties you would expect perfectly parallel straight lines with the slope of –45 degrees. On the other hand, if the parameter were set to 1, you would expect perpendicular lines with corners lying on the diagonal. The next DATA step transforms the variables from zero-one uniformly distributed to nonnegative exponentially distributed with parameter 0.5. Three indicator variables are added to the data set as well. SURVIVE1 and SURVIVE2 are equal to 1 if a respective company has remained in business for more than three years. SURVIVE is equal to 1 if both companies survived the same period together. The output of this code is given in Output 10.2.4 and in Output 10.2.5. Output 10.2.4 shows some descriptive statistics and two measures of correlation: Pearson and Kendall. Both of these measures indicate high and statistically significant dependence between life spans of two companies. Output 10.2.5 shows marginal distributions and scatter plots of simulated data. Distributions are noticeably close to exponential and scatter plots show a high degree of dependence. The result is shown in Output 10.2.6. Output 10.2.6 shows that the empirical default probabilities are 75% and 78%. Assuming that these companies are independent gives the probability estimate of both companies defaulting during the period of three years as: 0.75*0.78=0.59 (59%). Comparing this naive estimate with the much higher actual 83% joint default probability illustrates that neglecting the correlation between the two companies significantly underestimates the probability of default.